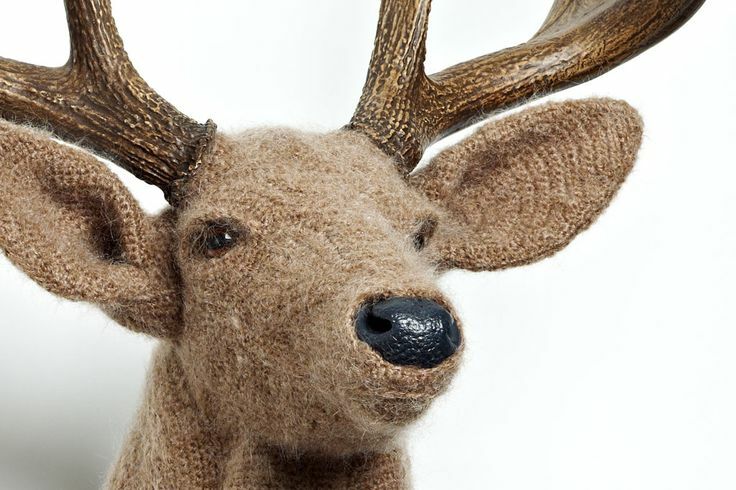 While I was having fun searching my favorite sites I ran across a picture of a deer that had been crocheted. I then said Wow! It looked so life like but it had been crocheted. 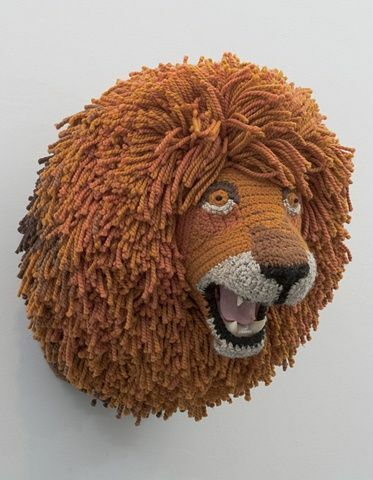 I of course then did some more research and found that there was some people that were doing a thing called Taxidermy Crochet. I wanted to know how you they had accomplished this art form. It was then on to more research to see if anyone had a pattern of taxidermy crochet. I soon discovered a form of Faux Taxidermy. 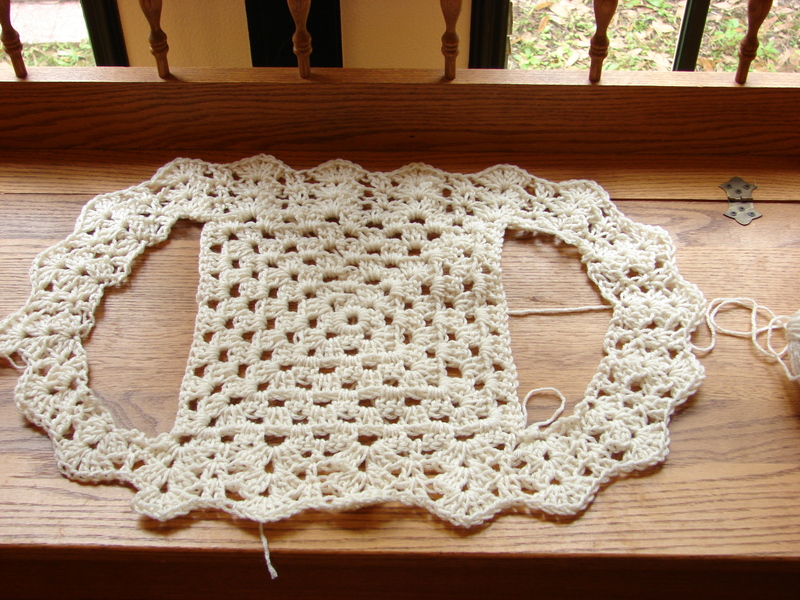 There were different ways to accomplish this form of crochet. This I thought would be great for a child’s room! 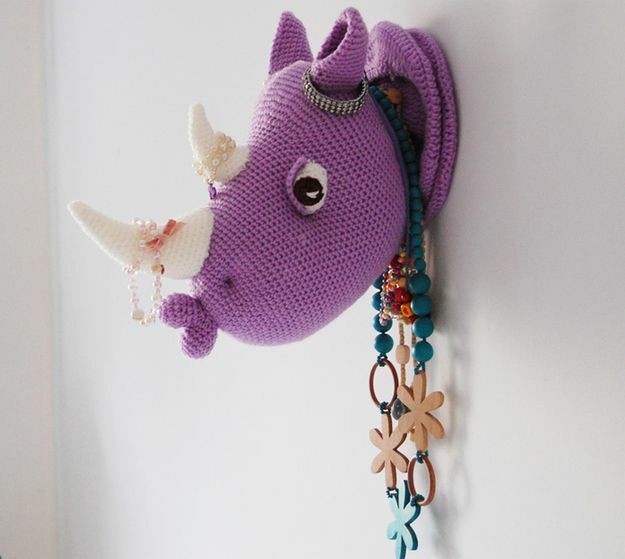 You can find her pattern at Ravelry: Rhinka the Rhino – Faux Taxidermy Head pattern by Sanda J. Dobrosavljev. I found quite a few of these kind of faux crochet on Pinterest that I thought were cute. Another way of the accomplishing the faux taxidermy is to use a sweater that you no longer want. I thought it was quite a unique way of adding some art to your home. Thank you for stopping by and coming into my world of creative crochet! How has everyone been this week? There are so many patterns of items that I would love to make and so little time. I thought I would share some of my favorite ones this week. I love looking on Pinterest, Craftsy, Raverly, for patterns that interest me. That could be anything from Home Decor items to Clothes, Amigurumi and so much more. There are so many more sites where you can search to your hearts content for what interests you. Here is an adorable Bear to make for a little one. I just loved the look of this and one of these days plan on making it! 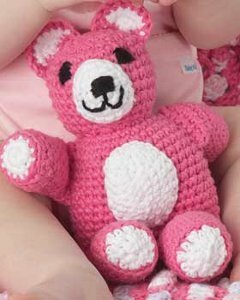 Here is the pattern Huggable Teddy Toy | AllFreeCrochet.com. Here is an adorable Sweater, Hat and Scarf set. Click the link for the pattern: Crochet – Apparel – Snow Girl. You can get the pattern here BIG & LITTLE DRESSES – Groovy Crochet. I love getting ideas and inspiration from looking up patterns. Thanks as always for stopping by!! 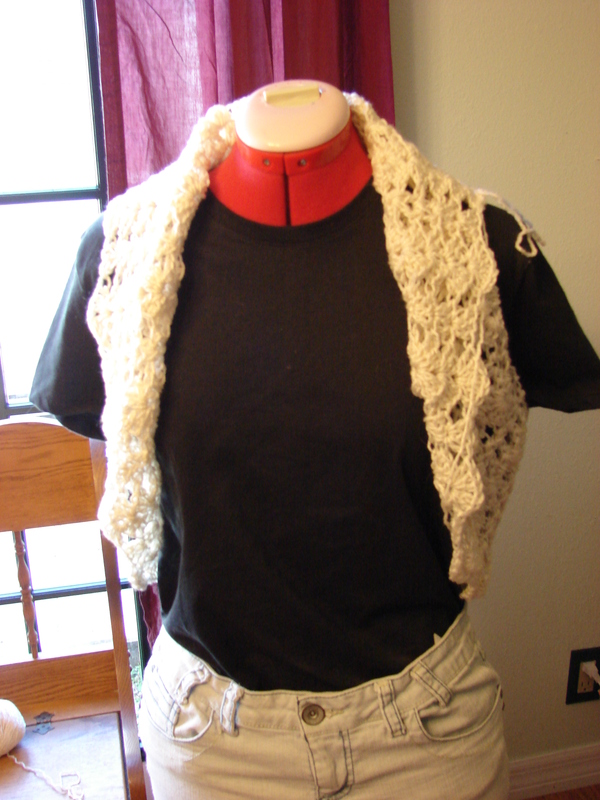 I started this project with a picture I had found of a vest I liked on Pinterest. I loved the way it looked and thought I would love to have one of those. I went to the site where it had been posted and it was not in English so even with the translation I was unable to get much from it for a pattern in words. The pictures on the other hand were a good start. If you want to check out the site just click this link Hobilerim ve ben: Hanım dilendi bey beğendi motifinden bolero. After I finished the granny square I went to the corner attached the yarn and chained 50 then attached it to the other corner on the same side then fastened off. I then proceeded to do the same for the other side. Rnd 1 From there I attached the yarn in the corner of the granny square in the ch 2 sp and made a shell of chained 3 which consists of the 1st dc in the shell then (2 dc, ch1, 3 dc) then I went to the ch 1 sp of the granny square and then 1 dc, the next ch 1 sp of the granny square made another shell of ( 3 dc, ch 1, 3 dc) and continued that sequence until I got the corner of the granny square. Once I got to the chain I skipped 3 chains and then made a shell of (3 dc, ch 1, 3 dc) in the next chain. You would skip 3 chains and do 1 dc in next chain. I continued that around to the corner of the granny square and do the same as the other side of the granny square. I continued the pattern of shells and 1 dc around the chain. I attached with a sl st to the beg chain of the shell. Rnd 2 I sl st to the ch 1 sp in the shell and ch 3 and continued to make another shell in the ch 1 sp. Next I put 2 dc on top of the dc in the rnd below. Went to the next shell and in the ch 1 sp made another shell, next st was on top of the dc from the rnd below and did just 1 dc. I continued in this sequence around alternating the 2 dc and 1 dc on top of the other dc from the rnd below. This was the way I ended up increasing around. Rnd 3 I increased by doing 2 dc in between the 2 dc in rnd below and then 2 dc on top of the 1 dc from the rnd below. The shells are always placed in the ch 1 sp of the shell below. From there I just have increased in the same manner as above with adding 3 dc instead of the 2 in between the shells. Below are a couple of pictures of what I have done so far. As you can see this is still a work in progress. I think it is coming together nicely! If you have any questions on what I have done please contact me. I will answer them as best as I can. Thanks as always for stopping by and taking a look! My New Fascination With Ponchos! Lately I have been into making Ponchos. I think they can be very versatile! There can be so many uses for them. They can be worn with jeans or date night attire and help keep you warm on a cool day or night. They can have a Lacey look or be Cabled to have a heavier look. Below are some of the Ponchos that I have finished and are available at Crochet & Craft items by Dunmirecrochetcorner on Etsy. 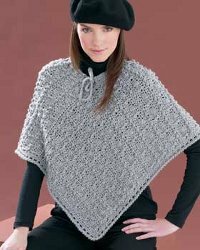 This one is fashioned for a more Casual and Modern Poncho with a hood. The pattern for this poncho I found at Free Crochet Pattern 40493-C Vertical-Stripe Poncho: Woman’s Version : Lion Brand Yarn Company. This is the basic pattern I ended up putting my own twist to it with buttons on the side and adding a hood. Both of these were fashioned from the same pattern from 1970 but with different stitches and lengths. You can do so many different things with one pattern if you switch out stitches, colors and experiment with the length etc. 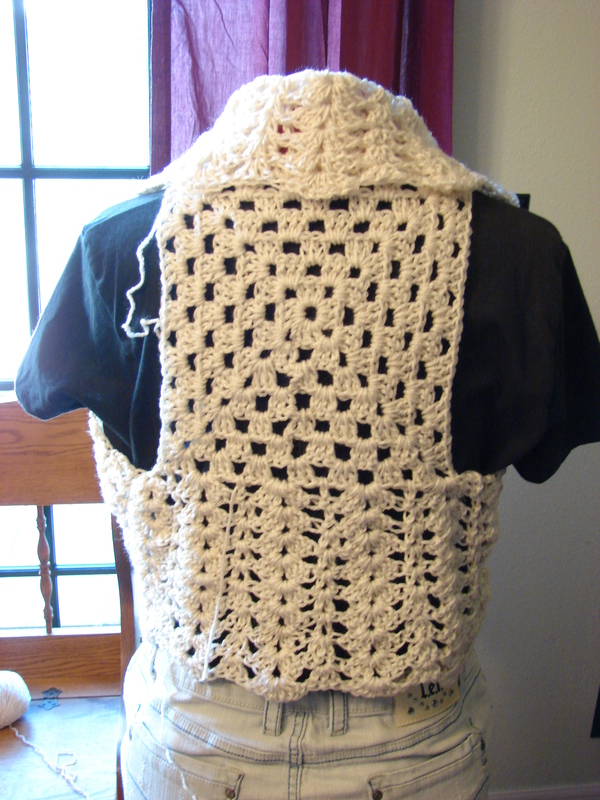 This is where I found this pattern PONCHO 3 COLOR – Groovy Crochet. I had found quite a few patterns online for Ponchos and here are some of those. Click on the picture and it will take you right to the pattern. It is amazing the different looks that you can come up with for a Poncho! I love that the Poncho has so many ways you can incorporate them into your wardrobe. Have you owned a Poncho and what have you worn it with? I am in the process of making me some different types of Ponchos for myself. Would love to hear from you and any ideas you have for wearing a Poncho. Thanks for stopping by and entering my world of crochet! I am going to start off with saying that the year of 2014 went by way too fast! It is a start of a New Year which means a chance to have a new way of thinking and a new beginning. I have never been one to really make a New Year’s Resolution, but this year I am thinking that I want to make one. I am going to have a goal of when I start a project I finish it within a set amount of time. I also want to get more organized with my craft room. You will have to stay tuned to see if I manage to make those resolutions through the year! My New Year’s project is to make me a coat for colder weather. We will be moving from Florida up to Iowa to be closer to the Grandchildren. Seeing we live in a warm climate now I am in need of a warmer wardrobe for the move up North. Below you will see what I have accomplished so far. This is the back of the coat. 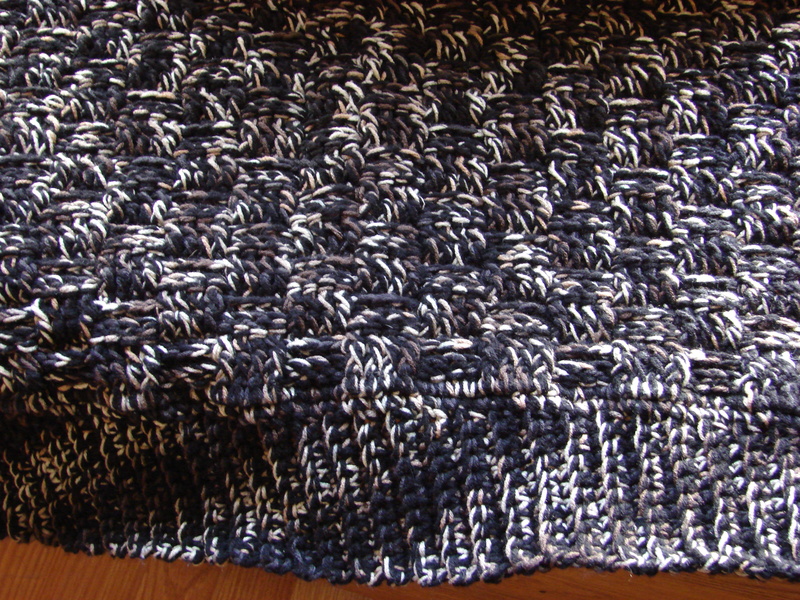 I have ribbed the bottom and the rest of it is made with a basket weave stitch. I am really going to have to work at the finishing one project before starting another. 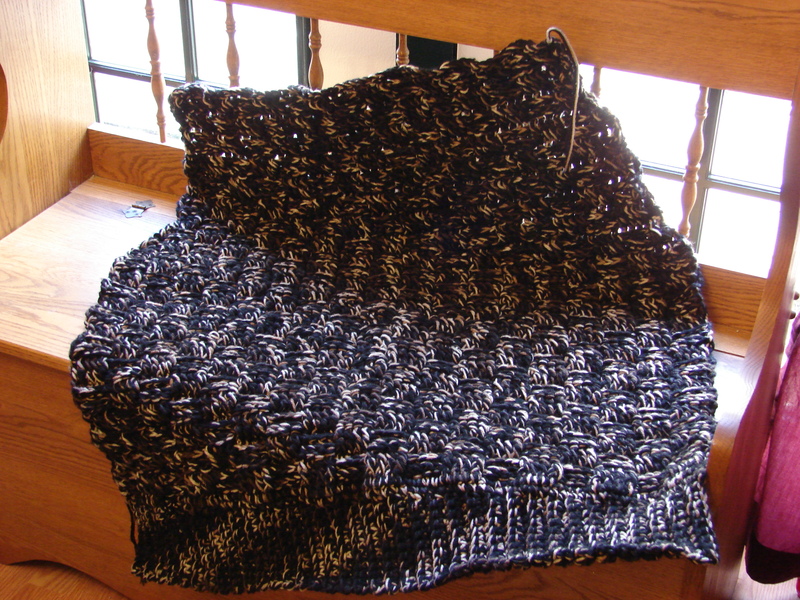 The reason I say that is because I am almost finished with a Poncho and I am in the middle of this coat. Have you ever wondered where the New Year’s Resolution came from or how long it has been around? Well I did so I did some research courtesy of Wikipedia. 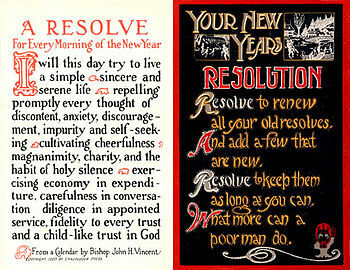 What I found out is that there were also some Religious beginnings to the tradition of New Year’s Resolutions. There are other religious parallels to this tradition. During Judaism’s New Year, Rosh Hashanah, through the High Holidays and culminating in Yom Kippur (the Day of Atonement), one is to reflect upon one’s wrongdoings over the year and both seek and offer forgiveness. People may act similarly during the Christian liturgical season of Lent, though the motive behind this holiday is more of sacrifice than of responsibility, in fact the practice of New Year’s resolutions partially came from the Lenten sacrifices. The concept, regardless of creed, is to reflect upon self-improvement annually. What kind of resolutions have you made through the years? I would love to hear some of them! 🙂 Thanks as always for stopping by my crazy world of crochet!